Starring Montgomery Clift, Aline MacMahon, Jarmila Novotna, Wendell Corey, Ivan Jandl. World War II changed the careers of some of the Hollywood directors that witnessed the combat firsthand. John Ford concentrated more on Westerns and patriotic subject matter, while comedy expert George Stevens became a much more serious maker of social documents and spiritual epics. Fred Zinnemann had made mostly short subjects before the war. He didn't go overseas but became a socially conscious director like Stevens. Among more mainstream films, Zinnemann would later make The Men, Marlon Brando's debut film about a paraplegic war veteran, High Noon, The Nun's Story and Julia. Zinnemann's most compelling social drama is 1948's The Search, which was filmed in the American Zone of Germany during the postwar occupation, around the same time as Billy Wilder's caustic farce A Foreign Affair and George Seaton's The Big Lift. For many Americans The Search was an introduction to the cruel realities facing "DPs" (Displaced Persons) in the wreckage of the European continent. Hundreds of thousands -- perhaps millions -- of homeless, wandering and abandoned people had to be sorted out. Among them were an alarming number of children separated from their parents, many of whom have been killed or murdered. The film was made for MGM by the German company Praesens-Film; it began as a German script and had to be altered to fit Americans into the main roles. 1 Naturalized American Zinnemann is one of the directors of the famous 1929 picture Menschen am Sonntag. Zinnemann may have been chosen to direct because of his German background, and because he'd just come off of two MGM pictures starring a child actor, Jackie "Butch" Jenkins. The Search is filmed in a semi-docu style reminiscent of Zinnemann's early German work. The aid agency UNRA is organizing the care and documenting of thousands of parentless children. They arrive in boxcars by the hundreds. No crying is heard at the Nuremburg station -- many of these kids have come straight from the concentration camps and silently, fearfully obey orders. Two boys escape from a transport ambulance in the belief that the vehicles are being used to gas them. The body of one is found in a river. The other is assumed to be dead, but is really hiding out in Berlin's ruins, alone and afraid. Mrs. Hannah Malik (Jarmila Novotna) has walked hundreds of miles from a Polish concentration camp in search of her missing son, Karel (Ivan Jandl). Her husband and daughter were murdered and she narrowly escaped the same fate. Mrs. Malik presents herself to UNRA director Mrs. Murray (Aline McMahon, of Gold Diggers of 1933). Murray has evidence that Karel is dead but Hannah refuses to believe it; she stays on to recover her strength before continuing her search. As the woman knows several languages and is good with children, Mrs. Murray hires her for day care work. The loving kindness of the UNRA caretakers brings many of the less traumatized children back to near normalcy. The determined but starving Karel is picked up by an American occupation soldier rebuilding German bridges. Ralph Stevenson (Montgomery Clift) can't get Karel to talk so names him "Jim" and begins to teach him English. Ralph's friend Jerry (Wendell Corey) eventually persuades Ralph to alert the proper authorities. They tell him that the tattooed number on Karel's arm places Karel with a specific group of kids, none of whose mothers have been located. Ralph determines to take Karel back to the United States. Meanwhile, Mrs. Malik has fully recovered and is preparing to resume her sad trek. The Search might be a disturbing, perhaps even tasteless exercise if it weren't for its commitment to realism and the sincere approach of the actors and director. The authentic locations and believability of the child actors must have been a shock to American audiences whose experience of the devastation had been limited to newsreels of burned buildings. This is what real concentration camps victims experienced after liberation; nobody disguises the tragedy. The children at first avoid cooperating with the personnel trying to identify them. Director Zinnemann plays an UNRA interpreter helping Mrs. Murray. The UNRA staff wears uniforms, and to the kids uniforms equal terror. Karel refuses to even speak; Mrs. Murray can't even determine his nationality. When Karel disappears, a Jewish boy steals his identity hoping for better treatment. Mrs. Malik is given false hope when first told that her son has been found. The little imposter who presents himself has been serving as a Catholic altar boy! This is Montgomery Clift's first movie, although Red River might have been filmed before. The instantly likeable Ralph forms a visible attachment to his new ward. Discovering the numbers on "Jim's" arm, Ralph feels guilty for having been stern with the boy. Their trusting relationship brings the boy out of his shell, although Karel carefully refrains from divulging any information that might send him back to the UNRA people. Karel seems to have forgotten most everything else, until an English lesson causes him to remember that he had a mother. He suddenly demands to know what happened to her. It's a great scene guaranteed to rip one's heart in two. Ralph has to tell Karel that his mother is gone. The kid is struck by this but bravely accepts what Ralph says. These are the postwar noir years and the Shirley Temple days are over. The Search ends with one of the most sentimental, yet sentimentally unforced endings ever. If the last shots make one's eyes tear up it's not because the director is working overtime for effect -- it's a natural response. Almost unique among movies about the Holocaust, The Search does not feel exploitative. Neither does it trivialize the disaster by focusing our interest on specific victims. Mrs. Malik and Karel are individuals but also represent the millions of lives shattered by the war. 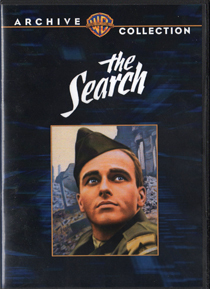 The Search looks excellent on the Warners Archive Collection's DVD-R. Although it doesn't have the look of a recent restoration it's in fine shape, with the docu-like greys of the cinematography well rendered. Robert Blum's unobtrusive and inspirational score is free of distortion. It's a highly recommended release. This is my own completely subjective response to The Search, but I cannot see the movie without thinking of a specific Paul Simon song (careful, spoiler). Conversely, I can't hear the song without thinking of this movie. 2. A very thorough web page on Jarmila Novotna, with full musical career coverage and many interesting photos, has been put together by Bruce Duffie. 3. I've heard The Search rejected by cinephiles that compare it unfavorably with more naturalistic (= grim, unrelentingly true to reality) films like Rossellini's Germany Year Zero. In this view the only honest movie is one that shows the hard facts in the most uncompromising way possible. This argument is all right until detractors label Zinnemann a hack, softening a serious subject for consumption by the MGM audience. I think that's entirely unfair. The films have different aims. The Search was made to impress a specific social problem onto the American public, and Zinnemann uses his skill to engage ordinary Americans. His film neither patronizes nor condescends to its audience, and it's reasonably faithful to the truth of burned-out Germany. The movie ends with a positive statement that surely encouraged aid to Europe. I like Rossellini's picture too, but its bleak ending is far easier to come by. The victims of war seem beyond saving, and the only response generated is despair.